Marist students returned to campus this fall to find a new system in place. On August 6, 2014 the Town of Poughkeepsie passed the Nuisance Party Law. For students, this means that hosting or attending a party that grows to be considered a disturbance will now come with consequences. Those who are being affected most by this new law are Marist upperclassmen with off-campus housing. Jaclyn Boccuzi, a Town of Poughkeepsie resident and Marist senior, was welcomed back to Marist with a $250 fine after hosting a small party. “I didn’t realize how serious this law was going to be taken until now that I have a fine to pay and a court appearance to make,” said Boccuzi. 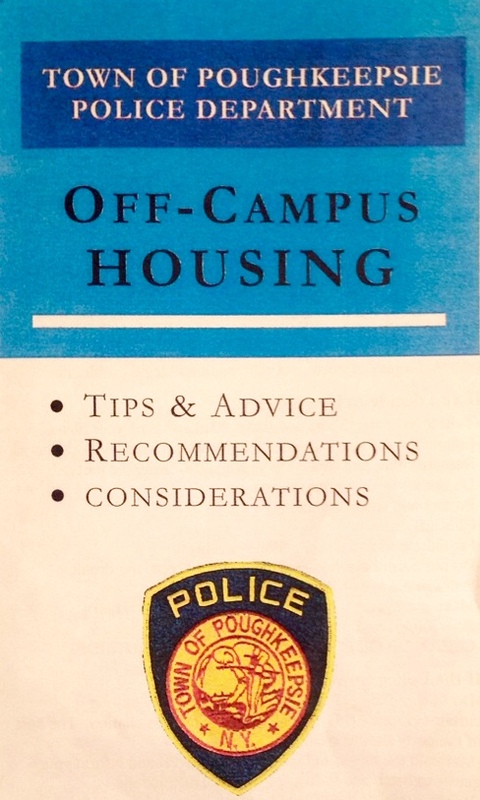 Off-campus housing pamphlet distributed to 81 student residences by Town of Poughkeepsie police. According to Chapter 144, by definition a Nuisance Party is described as a gathering on Town of Poughkeepsie property that results in any form of disruptive activity. This includes disorderly conduct, public urination, unlawful possession or use of a controlled substance and so on. Violators of this resolution may be subject to appearance tickets, fines up to $5,000, or imprisonment up to 15 days. In addition to the email, police officers visited 81 off-campus student residences to inform them of the new law. During this visit, officers briefed students about the consequences and handed out a pamphlet filled with advice and recommendations. “The police were very friendly in their visit. They explained that it’s not something that they want to do but it’s something they have to do,” said off-campus resident Alyssa Grates. At the quarterly Marist Coalition Meeting held on September 25, 2014 Gary Hult, Poughkeepsie Town officer, explained that over 40 tickets have been issued to off-campus students since August despite their informative efforts. Hult believes that this problem began over 20 years ago when students started to move off campus but it has become more serious in the last five years. He explained that the main reasoning for this law being put in effect is because of consistent complaints from non-student residents in the area. This ongoing problem hit its peak during senior week last year when many residents found the parties to be a large disturbance to the community. In addition to upsetting many students, the Nuisance Party Law will also affect local business owners. The owners of Rennies, a bar in Poughkeepsie popular among Marist students, expressed their concerns that this new law will push underage kids, with fake IDs in hand, to their bar. The owner of River Station, another Marist bar, felt the same way. One landlord of several Marist-rented houses within the Town of Poughkeepsie stated that this is becoming a serious worry of his. The law considers the property owner a responsible person along with the tenants and those attending. Not only is he nervous about getting hit with fines but he is also concerned with the future of off-campus housing. “If students continue to get in trouble like this, less and less kids are going to want to/be allowed to make the move off-campus because the consequences are becoming too severe,” said landlord Miller. Senior Amanda Hickey shared that she does not find the Nuisance Party Law to be a solution to the problem. Instead, it is creating an uproar among the student body. “If the senior class is stripped of its entitlements to tradition, we will find a way to have Senior Week regardless,” said Hickey. Hickey has chosen to become involved by working to bridge the communication gap between the class of 2015 and the residents of the Town of Poughkeepsie as part of her capping project. Her and two other seniors are looking to find some sort of middle ground so the rest of the year can run smoothly for both parties. This entry was posted in Off Campus and tagged Marist College, Marist Party Law, Marist Senior Week, Nuisance Party Law, Town of Poughkeepsie. Bookmark the permalink.